The Second River was made up from several brooks that flowed into it from the Eagle Rock Hills and the First Mountain, the primary stream being Wigwam Brook. The above map is dated 1872. 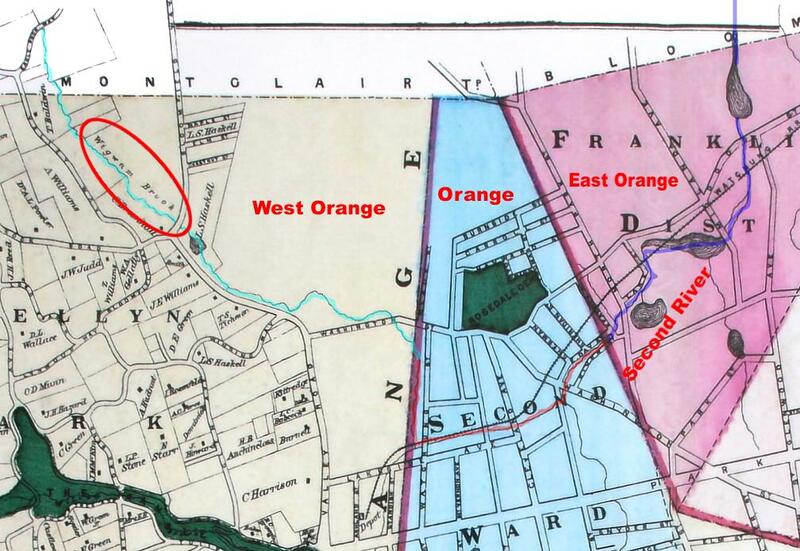 Play "Chase the River" by following the stream that flows openly in Watsessing Park today, and see how far you can trace it back to its origin in Montclair. Be prepared for a long hike, and under NO CIRCUMSTANCES should you go into the river itself, which, besides from being polluted by waste water discharged from the streets, has other dangers for which you can end up being arrested by the police. You can play "Chase the River" from the streets, and even by traveling the route shown on the map by car or bicycle.